Before you give up…you may want to try changing it up. As a self-publisher and frequent convention exhibitor, I learned that we often have to work a good long while before people will embrace our work. Sometimes it’s because comic book readers are naturally skeptic. They don’t want to invest in a new series, self-published or otherwise, until there are at least 5 finished issues or a collected trade paperback. Customers like to know someone else has tasted it and approved it before they give it a try. I’ve seen many a young cartoonist show up at the same convention year after year, improving with each new book, and finally winning the respect of their peers and perhaps some of the financial or critical success that eluded them. If we’re honest, often our lack of success is because we’re just not ready for prime time. Most cartoonists prefer to dive in first and learn our craft as we go. But what if other people don’t see our dreams the same way we do? How long do we tread water, believing in a dream if nothing ever seems to change? There’s nothing harder than realizing our personal project just isn’t going to hit it big. In our mind, the comic we’ve been working on since art school is this generation’s Star Wars…but something is getting lost in translation. We started self-publishing to be the next Jeff Smith…but what worked for him isn’t coming together the same way for us. So, it might be time to try a new dream that better reflects our current abilities. Put aside the old ideas (even if just temporarily) and switch gears. Break out of our box. Shake it up. Switch genres or art styles. Kill your darlings. See how it feels to face the unknown of a fresh canvas. Many of us worry that we only have one big story in us. And too often, that story is a trilogy or multi-part epic. Or we’re attached to a single character so much, we believe it to be an extension of ourselves. For years, my friend John Green and I self-published a comic book series called Quicken Forbidden, about a nerdy teenage girl who takes on dragons and magical forces in Manhattan. It was a mix of all the fantasy movies and books the two of us grew up loving, and we invested tons of money and time into publishing and promoting it. We took out ads in magazines, exhibited at any show we could, and built up a small but loyal group of readers. And it reached a slightly larger audience when the good folks at AiT/Planet Lar published the collected editions, and more libraries began purchasing graphic novels for their collections. But considering how much we loved the characters and worlds we created, it was always hard to understand why it wasn’t selling much better. So we kept at it, and continued to improve. Always chasing a dream that felt out of reach. On the side, John and I started doing other short comics and things that, originally, we didn’t take as seriously as Quicken Forbidden. Without the pressure of making something to be sold in comic shops, we just made silly hand-stapled mini-comics. Something extra to have on our table at Small Press Expo and other shows that specialized in DIY works. I did one called Go, Tortoise Boy, Go! that was half comic, half picture book. And John Green and I ended up turning a running joke of ours into an 8-page mini called Teen Boat! These books actually moved faster than anything else on our table. Partially because of the lower price point, but also because they took less time to explain/pitch. They were just looser concepts that people seemed to respond to. Astronaut Academy started in a similar way, as short comic with no greater ambition that to entertain myself and a few friends. 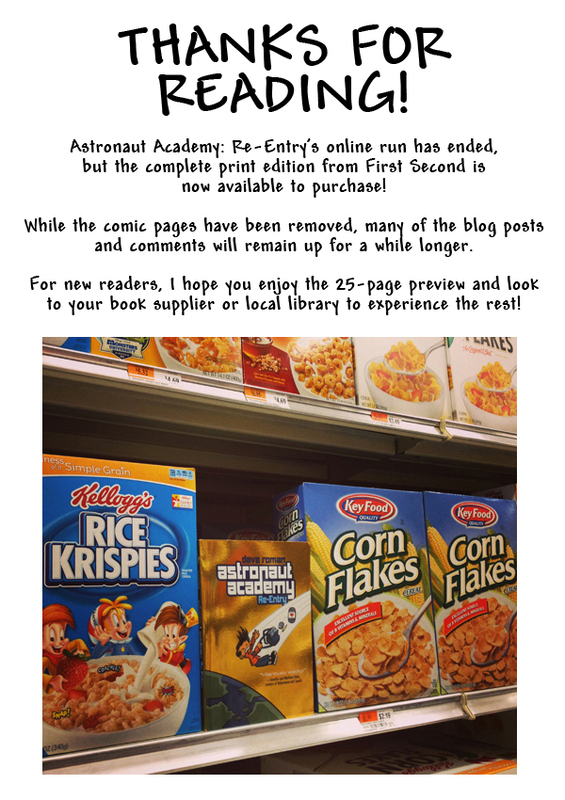 And now, both Astronaut Academy and Teen Boat! have been collected by major publishers, and have far exceeded the reach of our initial “dream project.” And yet, I still hear from people who only like the adventure and fantasy of Quicken Forbidden, and have no interest in our newer, sillier comics. So you really never know! But you have to be willing to try something new, if even just to strengthen the resolve of your initial dream. Even if our early works never lead to fame or fortune, we still enjoyed working on them, and in the case of Quicken Forbidden John and I plan to put out one final book. The time and effort is all valuable in the path to becoming better artists or storytellers. We don’t necessarily have to throw our first thousand paintings away before becoming masters, but we also shouldn’t be too precious about them. We mature not just as creators, but as human beings, with all sorts of life experience we didn’t have when we started. No matter what the genre, a story conceived by a 30-year-old compared to one by a 16-year-old will certainly spin off in very different directions. In the spirit of changing it up, another thing to consider is teamwork. Bringing outside voices to the collaborative process will force you to reevaluate your own tendencies, and possibly help transcend your art to new heights. A non-comics example I reflect on is the unique road to success found by Glen Hansard, one of my favorite singer/songwriters. He’s been performing with his band The Frames since 1990, recorded a bunch of brilliant albums, and always put on some of the best live shows I’ve ever seen. Hailing from Ireland, they toured small clubs for years and just couldn’t gain major traction in the United States. Around 2005, Glen went off and produced a “solo” album called The Swell Season with a young musician named Markéta Irglová, with whom he had an undeniable chemistry. John Carney, a former member of The Frames, decided to write and film a movie loosely based on their relationship (in which they both starred) and the music they made together (the soundtrack was a mix of songs from The Swell Season album and some new tracks). The movie was called Once, and ended up winning the duo an Academy Award for best song, which went on to inspire a Broadway show that won 8 Tony Awards including Best Musical of the Year. Glen and Marketa started selling out shows at Carnegie Hall as The Swell Season, a band that just happened to include all the members of The Frames. They even played a bunch of their old songs. For longtime fans, it was great to see the band finally get the attention we always thought they deserved. But what none of us realized was that, like the tagline for the film Once, they weren’t the same band anymore. The addition of Markéta Irglová and her beautiful piano and harmonies made all the difference. At least, when it came to making the music work for that larger audience. So, whether it be music, comics, prose, painting, or anything creative, stepping back can always help us gain perspective. Great food for thought Dave! Definitely going to let that simmer in the ole mental-creative kitchen for a while. Great companion piece to Calista’s article.